13 Interview Questions for Office Clerks in 2019 - Ready to Answer Them? 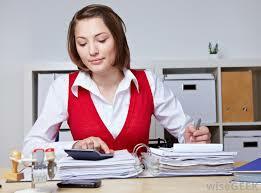 First step on your career ladder, or a good options for earning some extra income, office clerk is an interesting job. You will do a bit of everything, including answering phones, filling data, opening (or closing) envelopes, scheduling appointments, and other clerical duties. The exact working duties depend on your place of work. Let’s have a look at the questions you will face in the interview for this entry level job. Why do you want to work as a clerk? How do you imagine your typical day in this office? What are your expectations on office managers (other people you’ll work under)? Can you work with MS Office (or with other software)? Why clerk? Why not office manager or a secretary? Be honest, but try to find something positive about the job. You can say that you consider it a starting point for your career if office management, or that at this stage of your life you do not have much choice. You should also refer to things that make from you a good applicant for the position, such as diligence, attention to detail, responsibility, ability to work independently, good reading and writing skills, basic computer skills, etc. Try to speak with enthusiasm in your voice. They should not get the feeling that you apply only because there’s no other option for you. Show them that you are ready to work hard. You can say that you expect to get orders from office managers and/or administrative assistants, and follow them, performing a variety of clerical duties all day long. Do not go into details, such as going for a lunch or having a coffee break. These things belong to a daily life of every single office in the world, and you will enjoy your breaks. But it is better to talk about things which you will do in job, not about the breaks you will take in between doing them. Hint: Refer to a job description to understand better the exact things you’ll do in the office on a daily basis. Experience is not pivotal for your success in this interview. But you can mention anything you have done before, even at school or at home, that helped you to get ready for the job. For example writing something on computer, organizing the office, working on any repetitive tasks, being a part of a team at school, anything. Just show them that you are not afraid of work, and that this won’t be your very first experience with clerical tasks. As a good clerk, you should focus mostly on your own work. You should expect a lot from yourself–diligence, responsibility, working fast, making minimum mistakes, etc, and you should not care much about the work other people do–it is a responsibility of someone else. 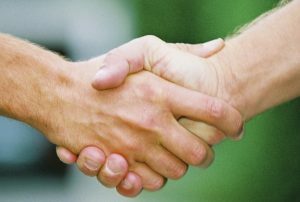 Anyway, you can say that you expect them to give you clear instructions on what you should do, and to have a friendly and professional relationship with you. You should be honest, and stay positive. 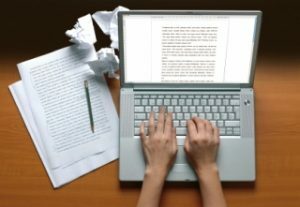 Even if you have no experience with certain computer program, you should ensure the interviewers that you are ready to learn to work with it–if the skill is is needed for the job. And if you have the experience, you can tell them how long you’ve been working with the software, where you learned the skill, and how it helped you in your past job or in your studies. Both office managers and secretaries earn more than the clerks do (at least in average they do). So the question makes sense, especially if you have the qualification which is required to become an office manager (or a secretary). You can tell them that you prefer to start with the basics, and want to learn the ins and outs of the daily life in the office, and hope to progress to the position of as secretary later on. Most hiring managers will be happy with such an answer, as it indicates that you plan to stay with them for several years. Anything you say at this point, it should not sound as if the salary was the most important thing in the world. I suggest you to say that you will accept the standard starting salary they pay for new hires on this position (in most cases they won’t offer you more anyway). Alternatively you can check the average salary for office clerks in your city (just Google it), and start with this number (for example, in 2017, the median annual salary for office clerks reached $30,600 in the US). 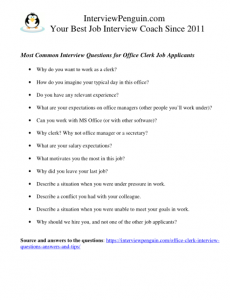 Interview for a position of an office clerk belongs to easier job interviews. You won’t typically compete with many other people for the job, and the expectations won’t be super high. If you manage to show the right attitude, and convince them of your motivation and willingness to work hard, most of the time they will hire you. Refer to our Interview Success Package if you are not sure how to answer some of the questions, and want to see brilliant interview answers to all difficult questions. Thank you!